Another busy month to finish my year. I was delighted to be asked to be a Guard of Honour at the Lord Mayor’s Show. This entailed greeting the new Lord Mayor at Mansion House when he returned from the parade and then having lunch in Mansion House. This followed a number of events with the Lord Mayors over the previous days. Firstly the outgoing Lady Mayoress hosted a thank you drinks party for all her supporters during the year, this included Pauleen Morton, who had raised money for the Lady Mayoress by swimming. Then the day before the Lord Mayor’s Show there was the Silent Ceremony in Guildhall with the swearing in of the new Lord Mayor. Other than his oath, everything is done in silence with many participants having to walk backwards. Yes we know how to put on a ceremony. That evening we had our Past Masters Association dinner. This year’s association is called the Spitfires and our consorts our Merlins and is a great way to keep in touch with all the Masters and Consorts you have met over the year. The dinner included an Elvis impersonator and plenty of dancing. It was fun to finish the year with a number of musical events, Philippa and I went to a Tchaikovsky recital at the Guildhall Art Gallery with readings from his life read by Simon Callow. My last day as Master saw many Masters and Wardens attend the Festival of St Cecilia run by the charity Help Musicians UK. I chaired my final meeting as Chair of our Investment Working Group. We decided to invest the £100,000 raised by our charity whisky auction. 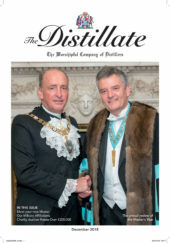 The Distillers’ Charity endowment now stands at over £1 million, which is a milestone we set a number of years ago. Our investment managers Cazenove invited me to their Charity Conference, which included looking into the future at ideas such as facial recognition and only insuring your car when you drive it. I was invited to the IWSC Presidents Dinner and was sat next door to Facundo Bacardi. We worked out that our great grandfathers started their respective drinks businesses a year apart. It reminded me of our City Debate topic of family against publicly controlled companies. The end of a wonderful year as Master ends with the Installation dinner and Martin Riley being installed as the new Master. I was also delighted to welcome the assistant Clerk into the livery. The Installation dinner shows off our livery at its best and I know the Company is in safe hands.